欢迎关注“陪娃玩英语”公众号，童谣精彩动作视频和动画等着您！Annie老师英文原版进口童书馆：lovereadingfun.baobaobooks.com。如有任何有关选书、英文启蒙进阶的困惑，可加Annie老师个人微信号：895888035。 Cows in the kitchen 厨房里的奶牛 Cows in the kitchen, Moo Moo Moo! 奶牛在厨房里，哞哞哞! Cows in the kitchen, Moo Moo Moo! 奶牛在厨房里，哞哞哞! 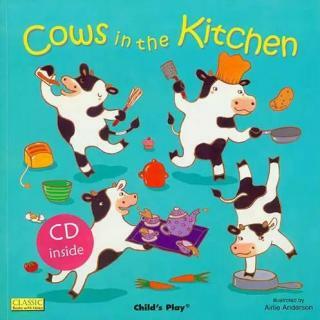 Cows in the kitchen, Moo Moo Moo! 奶牛在厨房里，哞哞哞! What shall we do, Tom Farmer? 我们该怎么办呢，农夫汤姆? Ducks in the dishes, Quack Quack Quack! 鸭子在盘子里，呱呱呱! Ducks in the dishes, Quack Quack Quack! 鸭子在盘子里，呱呱呱! Ducks in the dishes, Quack Quack Quack! 鸭子在盘子里，呱呱呱! What shall we do, Tom Farmer? 我们该怎么办呢，农夫汤姆? Cats in the cupboard, doggies too! 猫在橱柜里，狗狗也是! Cats in the cupboard, doggies too! 猫在橱柜里，狗狗也是! Cats in the cupboard, doggies too! 猫在橱柜里，狗狗也是! What shall we do, Tom Farmer? 我们该怎么办呢，农夫汤姆? Sheep in the shower, Baa Baa Baa! 绵羊在淋浴，咩咩咩! Sheep in the shower, Baa Baa Baa! 绵羊在淋浴，咩咩咩! Sheep in the shower, Baa Baa Baa! 绵羊在淋浴，咩咩咩! What shall we do, Tom Farmer? 我们该怎么办呢，农夫汤姆? Pigs in the garden, Oink Oink Oink! 猪在花园里，哼哼哼! Pigs in the garden, Oink Oink Oink! 猪在花园里，哼哼哼! Pigs in the garden, Oink Oink Oink! 猪在花园里，哼哼哼! What shall we do, Tom Farmer? 我们该怎么办呢，农夫汤姆? Goats in the greenhouse, Meh Meh Meh! 山羊在温室里，咩咩咩! Goats in the greenhouse, Meh Meh Meh! 山羊在温室里，咩咩咩! Goats in the greenhouse, Meh Meh Meh! 山羊在温室里，咩咩咩! What shall we do, Tom Farmer? 我们该怎么办呢，农夫汤姆? Chase them away, Shoo Shoo Shoo! 把他们赶走，嘘嘘嘘! Chase them away, Shoo Shoo Shoo! 把他们赶走，嘘嘘嘘! Chase them away, Shoo Shoo Shoo! 把他们赶走，嘘嘘嘘! That's what we'll do, Tom Farmer! 这就是我们要做的事情，农夫汤姆!